Last week I went along to the MLPR Press Day and came across these beauts. They're by a shoe and accessories label called Emmy. Emmy Scarterfield worked for big names such as Bottega Veneta and Giorgio Armani in Italy before coming back to the UK to launch accessory lines for French Connection. 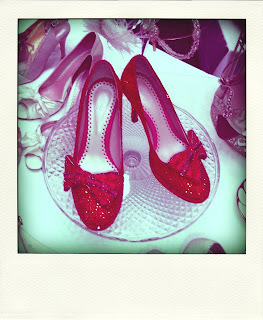 If you read my previous post, then you'll know that I'm determined to find the perfect pair of red Dorothy shoes. These are pretty much perfection but a little bit pricy - they will set you back £2000. This pair was custom made (like all of Emmy's shoes) with over 3000 Swarovski crystals. Just the detachable red bows themselves took 2 days to make. So once you take all that into consideration, the price doesn't seem that unreasonable. However I have been told by the lovely PR lady that a more wearable and affordable pair will be available soon. 加油！充實內函最重要！Beauty is but skin- deep.